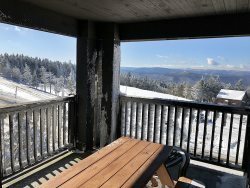 SNOWSHOE PROPERTIES MANAGEMENT,LLC offers the finest resort rentals throughout Snowshoe Mountain Ski Resort, located in the Allegheny Mountains of beautiful West Virginia. These Vacation Rentals are exclusive to us and are priced to fit any budget! Need help planning your West Virginia Wedding, Family Reunion, or Corporate Retreat? How about a Girls Getaway, Family Fun or a Romantic Rendezvous? SNOWSHOE PROPERTIES MANAGEMENT, LLC is Snowshoe Mountain's longest Independent Property Management and Vacation Rental Company. You can choose from a luxury home or budget efficiency. We offer more homes perfect for large family and social gatherings than any other rental company in the county. Many of our Vacation Homes have awesome views of either the slopes, Village, or the Western Territory---sunrise to sunset. With over 100 properties to choose from, you will find all of our rentals are furnished with linens, fully equipped kitchens(you bring the food! ), comfortable surroundings, warming fireplaces, and some will even permit your pet to accompany you on your SKI VACATION! Looking for a long stay in the mountains? We can help you---We can offer weekly rental rates and ski season long term rentals if the urge has struck you! WHERE WE TAKE CARE OF YOU AND YOUR VACATION NEEDS! FRIENDLY, PROFESSIONAL, KNOWLEDGEABLE STAFF HERE TO ASSIST YOU!